The LSR6312SP powered subwoofer is based on a 12" woofer with JBL's patented Neodymium Differential Drive NDD™ and 250 Watts of power. An integral bass-management system provides all the features you need for today's multi-format surround production including: LCR and Direct LFE inputs, summed output for chaining multiple subwoofers, -4 dB alignment setting, and JBL's new RMC™ Room Mode Correction system. RMC Calibration Kit included. 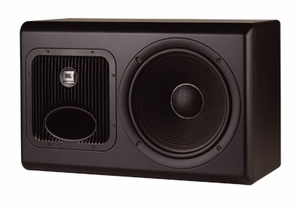 Multi-format powered subwoofer for Dolby Prologic, AC-3, DTS and other surround formats. RMC™ Room Mode Correction provides electronic control of response peaks due to room modes. RMC Calibration Kit included. 250 Watt continuous output power amplifier. Sophisticated LCR bass management system. Direct LFE input with selectable 10 dB input sensitivity. Summed output allows chaining of multiple LSR6312SP for multiple subwoofer systems. Neodymium Differential Drive NDD™ technology with dynamic braking for extended low frequency response and low power compression. High-density baffle for low resonance and stable inertial ground. Linear Dynamics Aperture port design eliminates port turbulence and reduces port compression. Reinforced enclosure and convenient mounting points for mounted installation.